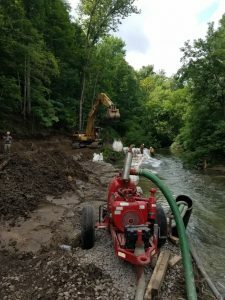 OCWA has several raw water and finished water transmission mains that extend from Otisco Lake into Marcellus and from Marcellus into Camillus and Fairmount respectively. For a large majority of their length these mains run along Nine Mile Creek and the railroad lines that parallel same. At one location in Camillus a section of finished water main exposure was discovered. Due to erosion from the adjacent creek, previously buried pipe had become exposed and was at risk of becoming undermined and washed out. To remedy this issue and restore the stability of the pipe, OCWA worked with an environmental consultant, NYSDEC, and the Army Corp of Engineers to develop a restoration design that protected OCWA’s main, while also meeting DEC’s needs for the adjacent creek and minimized impact to wetlands in the area. Use of natural stone for primary armoring of the area. 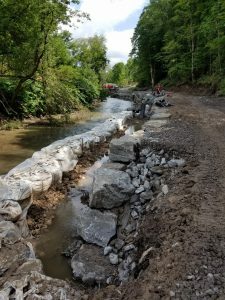 Restoration of existing streambed features for habitat through the installation of turning vanes (which create pools behind them while also serving to direct the energy of the water away from the pipe) and log vanes (which recreate the conditions observed in the stream around fallen trees prior to the project). The disturbed areas will be re-seeded with seed mixes specifically designed for wetland areas to help re-establish the appropriate native plant species. Some areas will be covered with erosion control fabric and planted with “live stakes”, which are essentially live, nursery grown, cuttings of native woody plant species that get hammered into the ground like a spike. These self-root and quickly establish the woody growth that would be expected on a stream bank of this nature. We expect to be complete this fall, early enough to have seed and planting sprout and germinate prior to winter.